1. Workers run the world. Everything would stop without our labour. 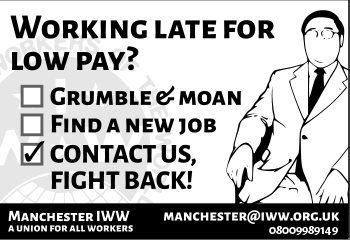 Withdrawing our labour is our weapon, and the right to run things is our demand. 2. At the same time, most work is a bore. As it is organised in our society, most work kills the spirit and body of the worker, not to mention the mind. But to simply call for a four hour day at eight hours pay is not enough. Who will benefit from the automation that could realise such a demand? Who should control technology’s introduction and integration into the economy? Potentially, we can. 3. Collective action is the source of our strength. Many of the direct actions described below can be done by individuals, but they are far more effective when done collectively. This should not be mistaken for unionism. If collective action and union activity are simultaneous, fine. But collective action is not limited to unions, for we shouldn’t rely on union leaders to tell us when to act. We need to organise ourselves, to promote and practice solidarity among ourselves. Friendships and common grievances are enough to carry out most of the actions below. 4. Don’t rely on others to win your demands for you. When it comes down to it, we are the only people who really understand and care about our problems, and the only ones who can sort them out. 5. Slow down. Your job is killing you anyway. When your boss tries to speed up the rate of work, drag your feet. 6. Take what is rightfully yours. If your boss refuses to give you breaks or longer lunches, get everybody on the job to take them anyway. 7. Work to rule. Follow every regulation and order to the last detail, no matter how stupid they are. If you get absurd instructions, carry them out to the letter to demonstrate their absurdity. 8. Leave your workstations and present your grievances to management en masse. 9. Don’t forget the power of sit-down strikes and wildcat walkouts. Well timed collective action can win a demand or grievance in minutes. 10. Produce your own propaganda. This is of course, the best way of getting your message across, while it also has the effect of letting other people know that they are not on their own. In this sense it can have far more effect than official union publications. 11. Don’t work as efficiently as you could. In this world, few people are paid according to the worth of the work that they do. Rather than give your all for nothing, work according to the principle of ‘bad pay = bad work’. Obviously, this is not to be practised in some service industries such as nursing, where its opposite, a ‘good work strike’, providing as good a service as possible, would be preferred. 12. All of this is the day-to-day preparation for more dramatic and effective forms of action, including strike action. By organising ourselves, using the union merely as a means of co-ordinating our actions, we will be taking some large steps towards improving the quality of our lives.